The standard Focus RS clutch is a AP racing item and is suitable for power output up to 400bhp/350lbf Ft when in good condition. We usually recommend either a Sach’s Motorsport organic clutch for modified road cars or a Sach’s Motorsport cerametalic for track usage. AP racing also offer uprated clutch’s in both organic and cerametalic paddle formats. The MTX75 box fitted in the Focus RS is a very strong unit, but we offer various modifications and upgrades. When tired, the standard ATB can be replaced with either a new Quaife ATB or a Kaaz unit. As std the gearbox oil tend’s to overheat when used on track or for racing, and as such we advise the fitment of a gearbox oil cooler and electronic pump for these applications. 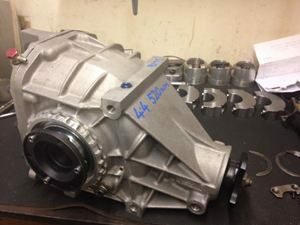 We also offer a shorter gearset to replace the rather long standard gearing, and this can be achieved either with a modified Ford gearset, or a Quaife gearset for race applications. Typically these gearsets produce 5th gear speeds of around 18 – 20mph per 1000rev. For Focus RS ECU mapping and conversions please see our Focus RS Remapping & ECU Conversions section.